These free printable cards may be blue but the recipients of them will never feel blue on their special day when you take time to think of a touching birthday greeting that will go inside this card. 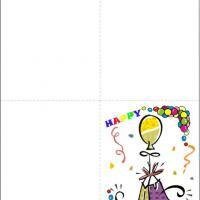 These printable birthday cards are just bursting with the birthday spirit! It includes a wonderful picture of a stack of presents, plenty of balloons, an array of stars, and of course, the cake. Everything any birthday girl or guy would love to have. 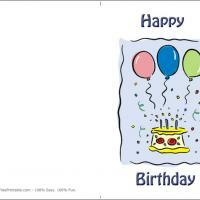 This card is also large enough for you to add your own decorations and a special birthday wish. If you're looking for a card that is bursting with color and good times, this is the one for you, so enjoy! Three Packages all trimmed in birthday fare are stacked all neatly with a bow to spare. One golden star leads a row of colorful stars and holds the string of one red balloon. All these items can only spell one thing! 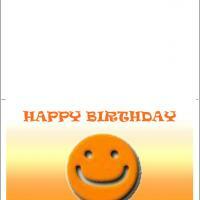 Have a happy and fun birthday just as the card says. The package boxes are red, green, and purple against a fading purple and white background. 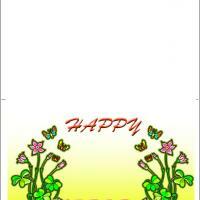 The inside is blank so you will want to add a special message tucked inside too. The oft ignored back cover completes this card with a fun birthday grouping of packages and a tall birthday cake. 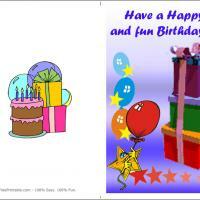 One gold star is the center of attention on the border of the Stars and Gifts free printable birthday card. It is leading a host of stars and holding onto some balloons all to showcase three large birthday packages. The boxes are all in bright cheery colors held together with a large bow in pink ribbon. The top of the front cover makes a declarative announcement for the birthday guest to have a happy and a fun birthday. And, how would they not when they receive this fine card filled with a custom printed personalized message just for them. And, look at the back cover to see another fun birthday shot of presents surrounding a pink-iced birthday cake complete with lit candles.